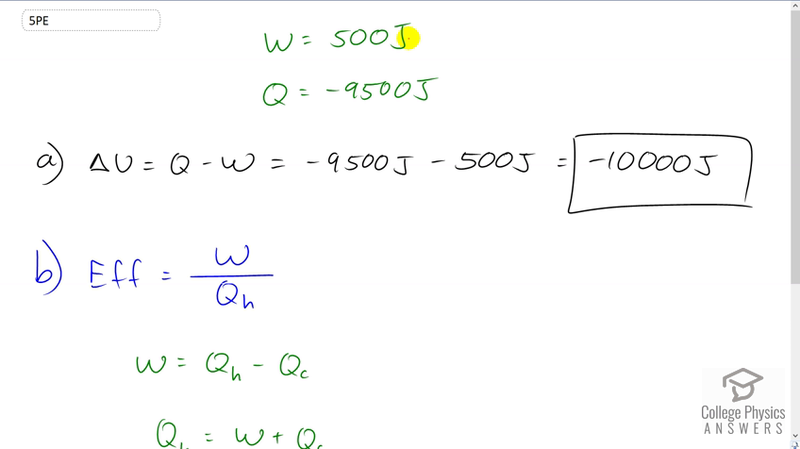 Suppose a woman does 500 J of work and 9500 J of heat transfer occurs into the environment in the process. (a) What is the decrease in her internal energy, assuming no change in temperature or consumption of food? (That is, there is no other energy transfer.) (b) What is her efficiency? This is College Physics Answers with Shaun Dychko A woman does 500 Joules of work. And so this W is positive because it's the work done by the woman. And there is 9500 Joules of energy transferred to the environment, and since it's going to the environment out of the system, it has a negative sign for Q. So the change in internal energy is: Q minus W so that's a negative 9500 Joules minus the 500 Joules of work done which is negative 10000 Joules change in internal energy. Efficiency is the amount of work done divided by the amount of energy consumed to do it. And so, for a heat engine, this is thought of as the amount of heat absorbed from the hot temperature reservoir. But in this case, the energy is coming from chemical potential energy of the food that the woman has eaten. But nevertheless, we can think of it the same way. And so, the work done is the difference between energy consumed minus the energy wasted by heat to the environment, to the cold temperature reservoir. And we'll solve for Qh by adding Qc to both sides and then switching the sides around and so we have the total energy consumed is the work done, plus the energy wasted. And so, the efficiency, then is the work done divided by the total energy consumed. That's gonna be 500 Joules divided by 500 plus 9500 and this makes an efficiency of 0.05. So 5 percent efficiency.